ABOVE: You are looking at the second-floor Sewing Room of the Cross House, designed by architect Charles W. Squires. In 1894, when the Cross House was built, a “sewing” room was traditionally a wife’s domain, or a Wife Cave in today’s terminology. A library was a husband’s domain. A sewing room was used by the woman of the house to, yes, sew, but more importantly it would also have been used as a nursery, a school (for when the children of the household were young), the private retreat of a wife, a place for a wife to confer with the cook and housekeeper, and a private place to entertain close friends of a wife. You see the balcony to the right? It is not a balcony, actually, but rather a porch inserted into the body of the house. It was open to the south and east, and through huge, almost circular, arched openings. Quite dramatic. You will also note that at the south end of the Sewing Room (the bottom of the plan) there are four windows. Two face south, one west (left), and one east (the one overlooking the porch). But…where is the door to the porch? I have owned the house for eight months and just discovered this very strange detail. I mean, did Mr. Squires really expect the first mistress of the Cross House, Susan Cross, to open a window, duck down, and crawl through a window to access her south-facing porch? This means two sashes 38-inches by 26-inches. This mean one transom window 40-inches by 22-inches. When I first noticed a window rather than a door (on the drawing) opening onto the porch, I just assumed this a mistake. Perhaps Mr. Squires, you know, had a little too much wine that night while at his drafting table? But the physical evidence supports that the drawing was correct. In the late 1920s the second-floor of the Cross House was converted into three apartments. In 1950 the house was made into the Palace Motel (New & Modern!). It was at this time, I surmise, that the Sewing Room porch was enclosed. 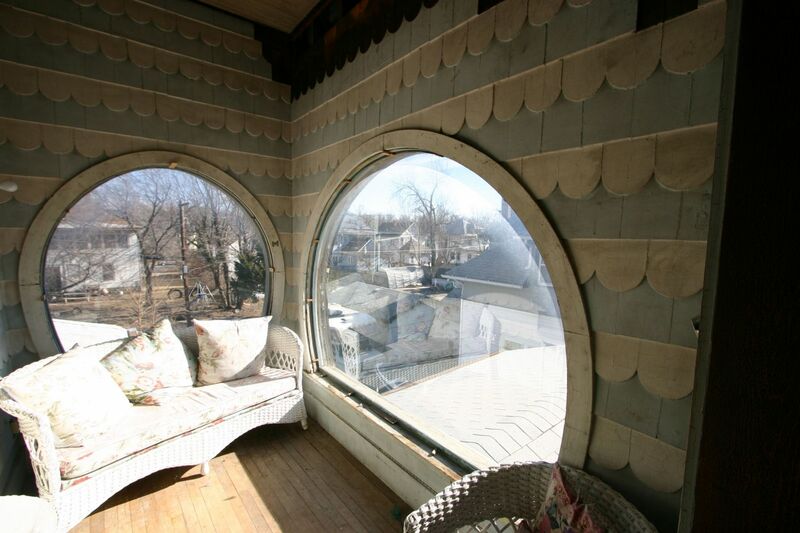 Its huge almost circular windows were infilled, and two small windows inserted. The east window of the sewing room was converted to a door opening so that one could gain access to a new walk-in closet (formerly the porch). 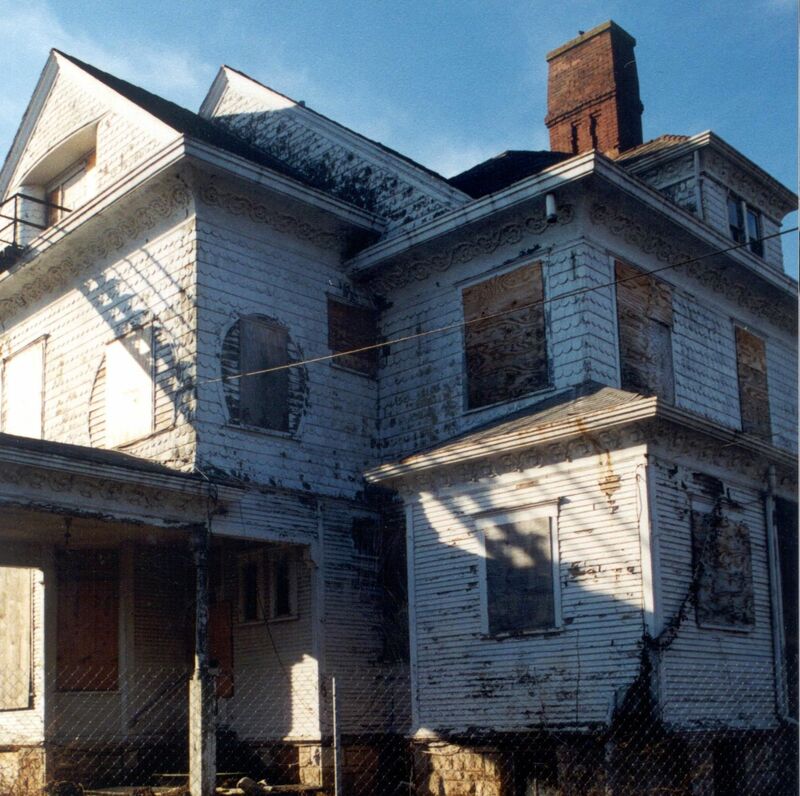 In 1999, when Debbi and Bob Rodak purchased the house, Bob’s first goal was to reopen the porch. The infill walls and their two mean windows were torn out. 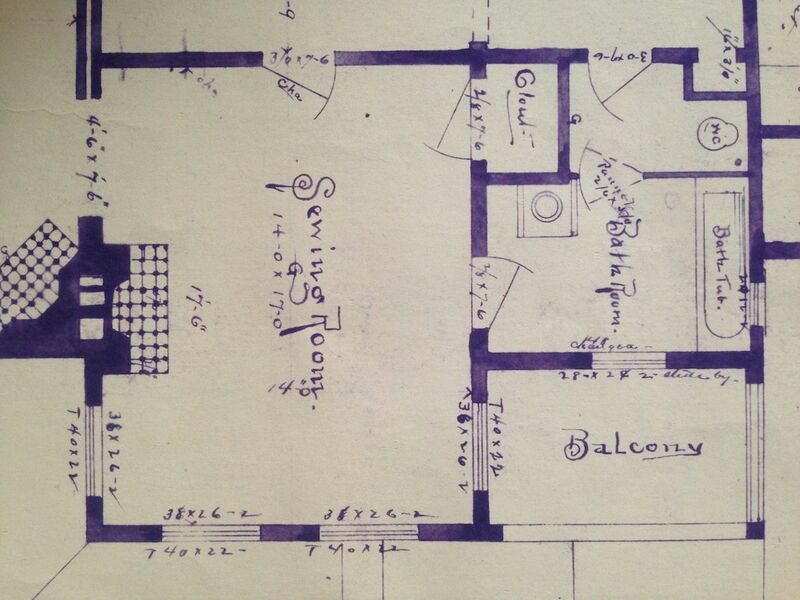 ABOVE: The 1894 blueprint. You can see the arched open porch to the right. The window inside the arch is actually in a wall BEHIND the arch, and lights the bathroom (although the window was not installed as shown). 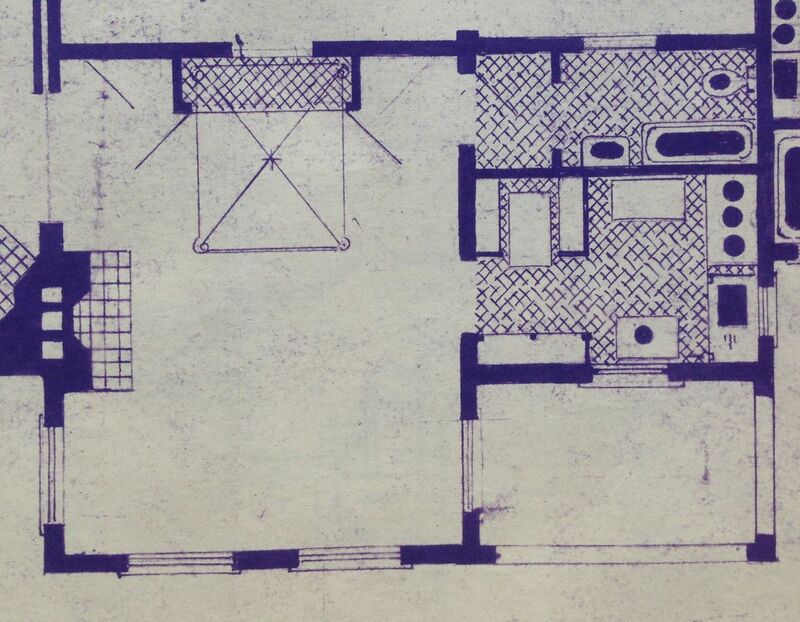 ABOVE: The 1920s apartment conversion plan. The bathroom is now a kitchen. The closet a bath. And the porch is still a porch, and still with no door. Very. Very. Strange. 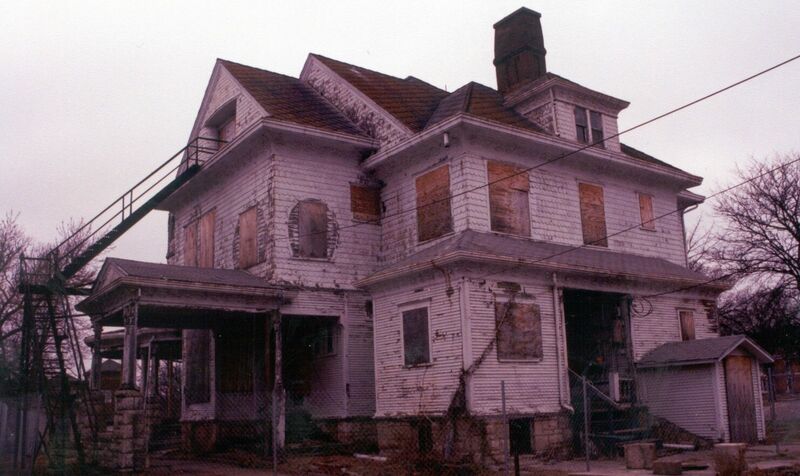 ABOVE: The Cross House in 1999, just after Debbi and Bob Rodak purchased it. Those crazy kids! The house was boarded up and circled by a six-foot-high chain-link fence. Very grim. 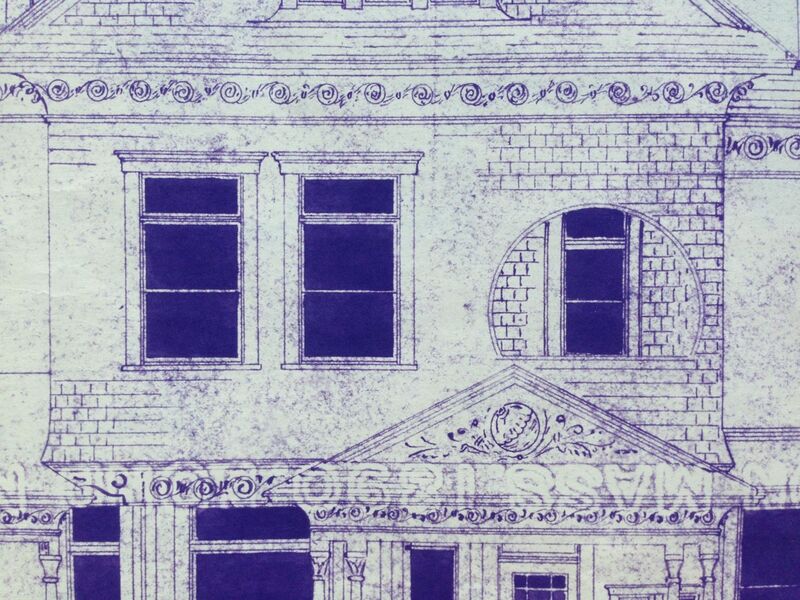 Anyway, if you note just above the porte-cochere (bottom left), you will see at the corner two almost circular openings which have been infilled with lap siding and two small windows. These openings were once open, and this is the porch off the sewing room — image courtesy of Bob Rodak. ABOVE: You can clearly see the infilled openings — image courtesy of Bob Rodak. ABOVE: From inside one can clearly see the infilled round openings. A sacrilege! A scandal! — image courtesy of Bob Rodak. ABOVE: One of the very first things Bob did was to re-open the porch, enclosed (presumably) since the 1920s. God love ’em. — image courtesy of Bob Rodak. ABOVE: A wonder! A glory! The porch, reopened. Bob put large sheets of glass in the openings so that the porch could be used in all weather. — image courtesy of Bob Rodak. So, did Susan Cross really have to open a window, duck down, and crawl through the window to access her south-facing porch? All the extant physical evidence supports this — surreal — conjecture. Had a door originally been on the east wall, it would have certainly been of the same width and height as the two other doors on the east Sewing Room wall. But no. The opening today matches the width and height of the three adjacent windows, thus (seemingly) confirming that the original 1894 drawing is correct: this was a window. As further proof, the two vertical pieces of interior trim have been lengthened, and exactly the length required to transform a window into a door. 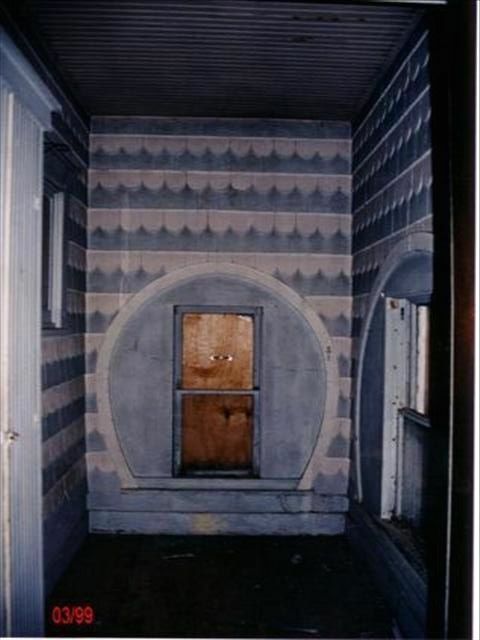 This is kinda slam-dunk evidence that the current door opening was originally a window, as stated on the 1894 drawings. It can be reasonably assumed that somebody soon realized how totally idiotic it was to have a glorious south-facing porch that one could not easily access. So, the window sashes were ripped out (as well as the stained-glass transom), the opening cut down to the floor, and — presto! — a proper entrance to the glorious porch was now at hand. I would have been on her side, and would have loved to have heard Mr. Squires explain that away! Initially, I liked the porch’s huge glass panels installed by Bob. Then I visited one of my neighbors. He also has a second floor porch, and it is open to weather. It is wonderful, and felt totally different than being behind glass. Then I also thought: Gee. I have a lot of interior rooms. A lot. But I have no covered outdoor space on the second floor. And in an instant I knew: I would fully reopen the porch by removing the glass panels. I am not, however, such a damn fool as to restore the original east Sewing Room window. Instead, I plan to recreate the lost stained-glass transom (its mate is directly to the west, thus assuring an accurate copy), and will install a pair of French doors under the transom to access the —open!!!!!! — porch. I look forward to sitting on the porch, with a glass of wine, and offering a toast to Susan Cross. 25 Responses to …but how did Mrs. Cross get to her porch? Ross, you’re the best — entertain, instruct, and provide laughter. You cannot imagine how much fun it is to read these posts. Well, as Eric is so utterly SCARY I dare not thwart his wishes! As much as I love plants, they are a no no in a “aged” home. You can substitute the real plants with silk ones. Living plants are beautiful, but they bring in moisture to an environment that needs to be preserved and maintained. Humidity to the Anne Queen Victorian style will have rheumatism and it is that is damaging for her. Sacrifices must be done to care for a home that I am certain to have been built using maple wood. Do not expose wooden surfaces to the sun! Think of it as the skin of a wealthy lady of that period. Portraits often shows a pale, white/ghost appearance. Why? Because ten skin was associated with someone who worked on the cotton fields. So the wither the better. A historical home carries the wisdom of time with it; if you own it, respect it. I’m not sure if this means anything, but I’m going to tell you about it anyway. Our 1886 Victorian also had a great little porch facing south and open to the east (we were 2 blocks from the beach, so being open to water views was really nice). But! There was no door, only a window. Was this some sort of odd trend? Definitely not uncommon! I LOVE old Victorian homes, and my sister is a real estate agent so I can get in to see many for sale… but it is not above me to simply go to a home that I’ve admired from the exterior and introduce myself to the inhabitants to tell them how beautiful their home/architecture is. Most the time I’ll get a tour out of it. And you would be surprised how many turn of the century homes have what appears to be functioning balconies without a door. I guess now I need to go research why. My sister, the agent, had one at her home in Wellington, KS. Can’t wait to finish this blog! Can you make the glass panels removable and bring them up for the winter? I agree with the other commenter that using the space for plants would be fun. And yes, French doors are a great idea. Plus, then you can have gorgeous old single paned French doors without drafts. I took a lot of liberties with the back of my house, which never had any architectural value to begin with. From what I can see, this will have no impact on yours. I could do removable glass panels but look forward to using the porch in all seasons. How nice to sit and watch a snowfall! Also, I’m confused about something else. Did your Victorian house have real closets? Yes. All the bedrooms had a closet. One even had a dressing room AND adjacent closet! “Sleeping porches were new and very popular, and the male Sibleys [Carney’s family, the Sibleys, owned the house] had built this one themselves. You entered it from a window in the closet of the boys’ room, and it darkened the bathroom deplorably, but it would hold two double beds and a single one. Curtains were hung between them. It was screened, and looked out into treetops. “We thought your house-party guests might like to sleep out here,” Mrs. Sibley said. “Fine,” Carney answered, her dimple flickering at the thought of Isobel [Carney’s roommate at Vassar] climbing through the closet window. So it seems like the idea of a entering a second-floor porch through a window wasn’t unheard of, at least in 1911. Maybe window entrances seemed safer than doors on the second floor. Wow! What an amazing discovery! Thank you!!!!! This is yet more confirmation that a window to a porch was not that unusual. As bizarre as this is! Then how could you get the beds out there? Through the window doesn’t seem likely. The porch is not large and would have fit a single bed. If a bed was ever used. A bed could have been hauled up a ladder through the huge openings. Ummm, now that I would like to have seen. I once lived in a two-story house that had a staircase with a SHARP L-bend. There was no way to get a queen (much less king) box spring upstairs. The solution was to remove the window sashes overlooking the front porch. Then somebody on the ground push the box spring up, while somebody on the roof grabbed it and hauled it up. Luckily, this was not required too often! I can’t remember where I heard it but at one time houses were taxed based on the amount of doors they had. And so, as seen in some houses, there are windows that swing wide open onto porches and they have a high sill (10″ maybe) that one has to step over. Clever I think as they’re not actually doors. In my mind I can also picture 24″ wide windows that have a 10″ wood panel at the bottom. That part swings open too. Perhaps the builders were then scheming all sorts of ways around this door taxing issue. And it could be that at the time your house was being built they hadn’t yet devised anyways around it. n 1696, England implemented a window tax, where homeowners were taxed based on the number of windows they had. 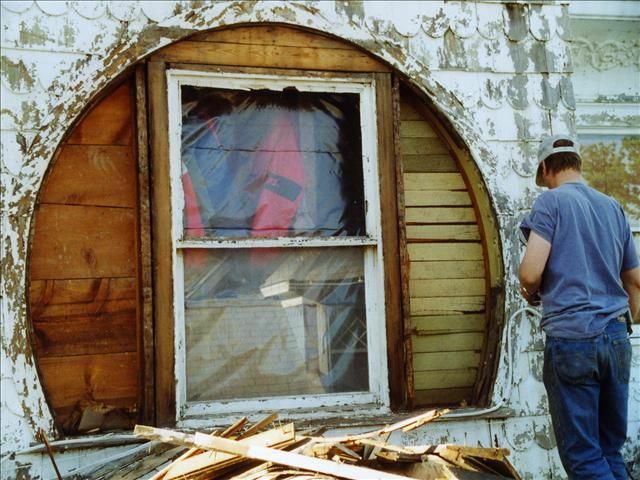 Consequently, people started building with fewer windows in order to avoid the tax. Due to the number of health problems created by the lack of fresh air, the tax was eventually abolished in 1851. I have seen this in several old plan books I have. While it doesn’t make sense to us in this day and age, it wasn’t unheard of back then. While the home we own (Foursquare built in 1913) has a door to the sleeping porch, some of the other homes we looked at (ranging from 1890 to 1925) had sleeping porches and small balconies accessible only by large double-hung windows. I’ve heard the tax explanation before, but haven’t seen any documented evidence of it. It’s possible that a window was just a more economical fenestration to access a seldom-used outdoor space. The ones I’ve seen were generally tall windows with a low sill, so going through would not have been that difficult. Just posting to say that I own a 19th-century house which has come down in my family since it was built, and the second-story porch has always been accessed by climbing out a window. The window is fairly low so this is not difficult. I really enjoy your blog posts!! Full of laughter and love!